Once again it has taken ages to get an update on here. Megan & I have been rolling around the north island for almost two weeks. 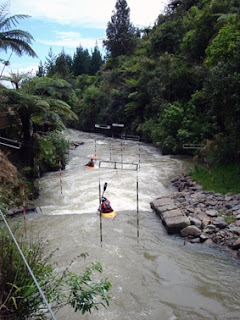 Mangahao Slalom Course & Whitewater Park. First stop on the way north was Mangahao, NZ's 1st man made whitewater course based around 30 minutes south of Palmerston North near the town of Shannon. When we were there the course was running at 16 cumecs. Both Megan & I wished we had slalom boats but still enjoyed multiple runs down the course. Megan spent the time adjusting to her new Prijon Creeker & I played around in a couple of the holes down the course. A couple of local paddlers showed up while we there. Don't remember their names but they ended up sneaking their way into my photos. 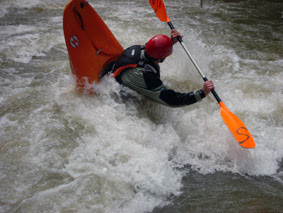 Local paddler (who remains nameless) playing in a small hole mid course. Looking down the 2nd half of the slalom course.